The City of Caldwell is named for U.S. Senator, Alexander Caldwell. A brief biography is given here. ALEXANDER CALDWELL. Among the notable men in the history of Kansas, few are more deserving of perpetuation in its annals than is Alexander Caldwell. From the time when he came to Leavenworth, in the spring of 1861, until his recent retirement from the cares of active life, he was identified with events and movements that made Kansas history in numerous and diversified directions. A pioneer in the work of transporting military supplies to the army posts west of the Missouri River, with the coming of the railroads he turned his attention to railroad construction and management; as a manufacturer he became one of the prominent figures in Fort Leavenworth's industrial life; as a financier he was the directing head of what became one of the leading financial institutions of the state; and in public life he held positions of high honor and trust. He was the father of the Soldiers' Home at Leavenworth, and was also instrumental in the securing of an appropriation for the establishment of the United States Military Prison (now the Federal Penitentiary) at this point. His entire career has been one which has reflected honor and credit upon his splendid abilities, his absolute integrity and his devotion to high ideals of citizenship. Alexander Caldwell comes of notable ancestry. Born in Huntingdon County, Pennsylvania, March 1, 1830, he is a son of James Caldwell and a grandson of Alexander Caldwell, who was the progenitor of the family in America. The elder Alexander Caldwell was a native of County Donegal, Ireland, and on coming to America settled in New Jersey, where he followed farming in connection with operating a stone quarry, and where he died. James Caldwell, his son, was also a native of Ireland, and for years operated a charcoal furnace and iron furnace in Pennsylvania. He married Jane Matilda Drake, a daughter of James Drake, who was the proprietor of Drake's Ferry, across the Juniata River, ten miles below Huntingdon, Pennsylvania, and who was a member of the family of Sir Francis Drake, and a lineal descendant of Sir Thomas Drake of England. James Caldwell served in our war with Mexico, being captain of Company M, Second Regiment, Pennsylvania Volunteer Infantry, and was mortally wounded at the battle of Chapultepec, September 12-14, 1847, and died. Alexander Caldwell, of Leavenworth, had but limited advantages in his boyhood. He was clerk in a store at Columbia, Lancaster County, Pennsylvania, when his father enlisted in the Mexican war, being seventeen years of age at this time, and, leaving his clerkship, overtook his father at Pittsburgh and persuaded the elder man to allow him to join Company M as a private. Thus, at an age when he should have been in school, he fought at National Bridge, Puebla, Contreras, Churubusco, Chapultepec, Monterey and the skirmishes around the city of Mexico. He returned to his native state fatherless, and for a time found employment as cashier in the First National Bank of Columbia, where he gained a thorough knowledge of banking, which was to stand him in good stead in later years. Mr. Caldwell came to Leavenworth, Kansas, in the spring of 1861, and for a time contracted with the United States Government to transport army supplies to the military posts west of the Monroe River, and to Salt Lake City, under the firm name of A. Caldwell & Company. While engaged in this work he had considerable dealings with the Mormons at Salt Lake City, and notably with the great leader, Brigham Young. In this transporting work he employed as many as 5,000 teams and 60,000 head of oxen, and provided employment for upwards of 5,000 men. He continued in this line of endeavor until the building of the railroads. During this time he became interested in railroad construction work, and had the contract for the building of the Missouri Pacific Railroad from Kansas City to Leavenworth in 1866 and in 1869 extended this line to Atchison. He remained as president of the road until it was sold. With others, he organized the Kansas Central Railroad Company and built its line from Leavenworth to Miltonville, Kansas, later serving as vice president of the company. During this time Mr. Caldwell had become one of the foremost figures and a potent factor in affairs in Kansas. In 1871 he was elected United States Senator to succeed Senator Ross, who was the successor of Senator Lane, and served in the session of 1872 and 1873, then resigning his exalted position to attend to a multiplicity of other duties. As senator, he was instrumental in having passed the bill that required one term annually of the United States Court be held at Leavenworth, was instrumental in securing an appropriation for the establishment of the United States Military Prison (now the United States Penitentiary) at Fort Leavenworth, was instrumental in having the Old Soldiers' Home established here, and on two occasions when Fort Leavenworth was in imminent danger of being abolished was the prime factor in having it retained here. From 1874 until 1888, with Mr. Caldwell as its president, the Kansas Manufacturing Company, at Leavenworth, was one of the important commercial houses of the West, furnished employment for hundreds of men, and the Caldwell wagon, manufactured by the concern, was sold by the thousands all over, the western part of the country. When the First National Bank at Leavenworth was established, Mr. Caldwell became a depositor, and later a director. In January, 1897, he was elected president of this institution, a position he has since held, and to his keen business acumen the bank is indebted for the position it occupies today as one of the foremost financial institutions in Kansas. So long as history endures, the name of Alexander Caldwell will stand in a foremost position among the great men of Kansas. Mr. Caldwell married Miss Mace A. Heise, of Columbia, Pennsylvania, a member of an old and honored family of that region, and three daughters were born to that union: Minnie, Emily and Pattie, the last-named of whom died in 1889, at the age of eighteen years, unmarried. Minnie became the wife of Dr. Squire S. Taylor, who died in December, 1889. Two children were born to them: Geraldine Caldwell, now the wife of Maj. Clarence O. Sherill, United States Engineer; and Alexander Caldwell, who, in order to perpetuate his grandfather's name, dropped the name of Taylor and is known as Alexander Caldwell only. Mrs. Taylor later married John D. Robertson, who died January 6, 1908. Emily married Harry C. Grace, now residing at Washington, D. C., and is the mother of one child: Olive Caldwell. A Standard History of Kansas and Kansans, written & compiled by William E. Connelley, Secretary of the Kansas State Historical Society, Topeka. Chicago: Lewis Publishing Company, copyright 1918; transcribed by David Rago, student from USD 508, Baxter Springs Middle School, Baxter Springs, Kansas, 1-28-99. Caldwell, the terminus of the Southern Central & Fort Scott Railway, was located on March 7, 1871, and named in honor of United States Senator Caldwell, of Leavenworth. The town company which accomplished this location, consisted of Charles Gilbert, president; G. A. Smith, secretary; C. H. Stone, treasurer and J. H. Dagner. The land comprised in the town site was 113 acres, on Fall Creek, and was purchased from the Government. The first building erected was the log store of C. H. Stone, put up by the town company, the second, also of logs, was built by Charles Sullivan. The first frame building was put up by George Haines, the spring of 1872, and was used for hotel purposes. The first physician was B. W. Fox, the first attorney, L. B. Hasbrook, who was hung for complicity in horse thieving, on Slate Creek, in 1874. The fist wedding in the town occurred on August 23, 1872, the contracting parties being George Grant and Christina Reid, and Dr. B. W. Fox, officiating. Up to 1879 the town was little more than a trading point, and had in that year but 260 inhabitants. With the railway, came a rapid growth which has made Caldwell one of the liveliest cities of 1,500 inhabitants in the West, and will soon raise it to the grade of second class cities. On July 22, 1879, Caldwell presented a petition to be incorporated as a city of the third class. An election was ordered for August 7, and resulted in the selection of N. J. Dixon, Mayor; J. D. Kelly, Police Judge; J. A. Blair, F. G. Hussen, H. C. Challes and A. Rhoades, Councilmen. J. D. Kelly, Jr., was appointed City Clerk. In September, 1879, Mayor Dixon died, and C. M. Hollister, was elected to fill vacancy. In 1880, M. Meaglier was elected Mayor, W. N. Hubbell in 1881 and A. M. Colson in 1882. J. D. Kelly has held the office of Police Judge from the organization of the city to the present time. 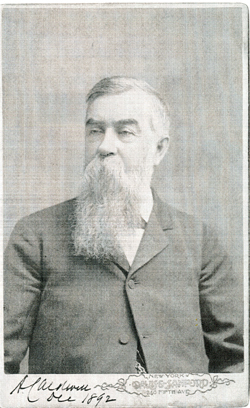 J. D. Kelly, Jr., was City Clerk in 1880; L. M. Lange, in 1881, and J. W. Nyce, in 1882. The City Council for 1882-83, consists of A. McLain, J. W. Dobson, M. H. Bennett, C. W. Willett and William Corsine. A postoffice was established at this point in 1871, and C. H. Stone kept it in his log store building, the first in the town site. Stone was succeeded by G. W. Robinson, John A. Blair, John H. Sain, John A. Blair, a second term and S. Donaldson the present Postmaster. The business of the office has been transacted in the old log store, Sain's drug store, at the corner of Fourth and Main, Fifth and Main, the Hubbell building and a store near Sixth and Main streets, where it remained until November, 1881, when it was removed to its present quarters. The first money order was issued on April 15, 1881, and transferred money from S. W. Dutton, of Caldwell, to Susie Dutton, at El Dorado. The office became a Presidential one, July 1, 1881. SCHOOLS, CHURCHES, AND THE PRESS. The Caldwell school district was organized on September 21, 1872. Its teachers have been - A. B. Castleman, Miss Fannie Herrington, Miss Carrie Dixon, J. V. Ratliff, J. C. Goodell, J. D. Kelly, Jr., S. S. Clark, and the present force, which consists of N. D. Stevenson, Principal, Miss Flora Sweet, Miss Mattie Oatman, Miss Mary Vasey and Geo. W. Ewing. The first school house was a frame building 20x30 feet, and costing $1,200. This was in use until 1880, when another frame 30x40 feet, and costing $1,700, was built. The present fine brick schoolhouse was erected in 1882. It is 56x76 feet, two stories in height, cost $15,000, and has seven rooms exclusive of those in the basement. It is heated throughout by furnaces, and has all the latest appliances for successful working. Methodist Church - Caldwell Mission was organized in 1873, and Rev. B. C. Swartz placed in charge of the circuit, which then embraced all of Sumner south of Slate Creek, and that part of Cowley County west of the Arkansas river. After a years' labor the entire membership of the circuit was seventy-three. Rev. I. N. Boycourt, was for a short time associated with Rev. Mr. Swartz in the work. J. B. Herbert received the appointment in 1874-75, but the conference of 1876 left the field vacant. Later in the same year E. B. Abbott took the work and filled through 1877. Caldwell class was organized February 15, 1877, and Andrew Ryan served until the close of 1879, when Rev. S. Wood was appointed and served until March 12, 1882, when Rev. D. F. Owens, the present pastor took charge. The fine brick church now in use was begun in Mr. Wood's pastorate, and dedicated on November 13, 1881, but not completed until late 1882. As first erected it had a tall spire, which yielded to a violent storm in the fall of 1882, and falling injured the body of the church. The building's total cost was $4,200. The society now numbers 123, and is growing steadily and quite rapidly. A Sabbath school, organized at about the same time as the church, has an average attendance of 115, and is in charge of A. G. Herr. The Presbyterian Church was organized in 1873 by Rev. J. P. Harsen, of Wichita, and Rev. J. B. Rideout became pastor in charge of the eleven members who constituted the infant church. Rev. J. S. McClung followed Rev. Mr. Rideout, and remained until April, 1882, when Rev. E. P. Foster, the present pastor, took charge. A church edifice, which was built in 1880, a at (sic) cost of $1,800. The society now numbers fifty-three. A Sabbath school organized at the same time as the church, has an average attendance of 100, and is in charge of H. A. Ross. The Christian Church of Caldwell was organized on May 9, 1880, with a membership of thirty-six. Rev. T. W. Houston, its first pastor, was succeeded by Revs. A. W. Avery and A. Crenshaw, who close his pastorate in 1882. The society own and occupy the old school building erected in 1880 at the cost of $1,700. The present church membership is thirty-six. The Roman Catholics of Caldwell have, as yet, no church organization, but are supplied by Rev. Father Kelly of Winfield, who performs services on the last Sunday of each month. The Caldwell Post made its first entry upon public life in January, 1879, under the management of J. D. Kelly and T. H. B. Ross. This was practically the second issue, the "Eye Opener" having been printed on December 28, 1878, by the same parties. After just six months, Ross retired from the journal and Kelly continued it alone, until December 11, 1880. It then passed into the hands of J. H. Sain, who held it until April 1, 1881, when it was purchased by Tell W. Walton, who now runs it. Its first appearance was as a six-column folio, and this form was retained until April, 1879, when it was enlarged to a seven-column sheet. It is now largely devoted to live stock interests and is recognized as the organ of the cattle men having herds in the Indian Territory, near Caldwell. Its circulation is 1,000. 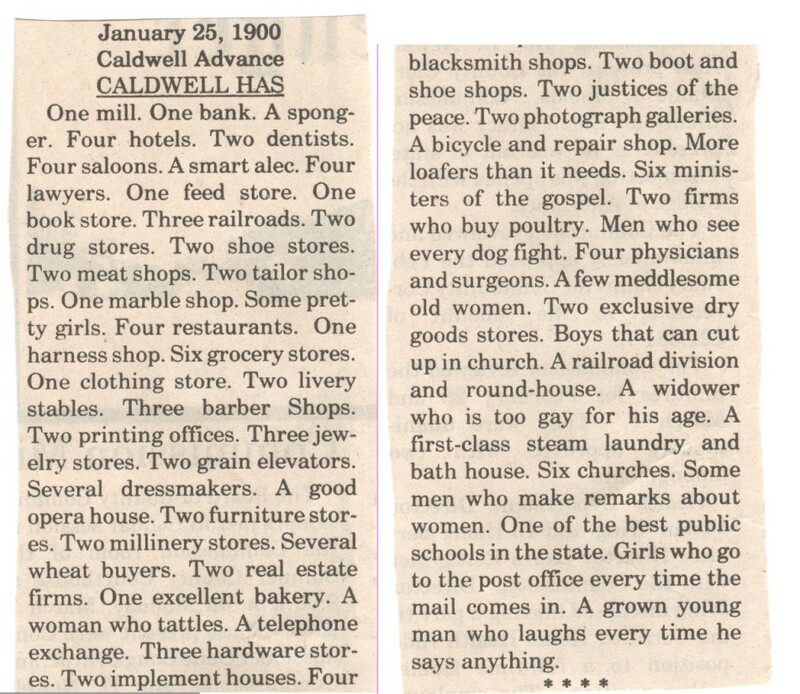 The Commercial - The first issue of the Caldwell Commercial appeared May 6, 1880, as an eight-column folio, a form in which the paper still appears. Its editor and proprietor from the initiatory number to the present time, is W. B. Hutchinson. It is issued Thursdays, is Republican and has a circulation of 500. Sumner Lodge, No. 203, A., F. & A. M., was organized with a membership of fourteen and the following officers: R. Bates, W. M.; S. P. G. Lewis, secretary. The order now has thirty-five members and the following officers: E. A. Fletcher, W. M., S. L. Long, S. W.; D. D. Leahy, J. W.; C. F. Sommer, secretary; L. G. Bailey, treasurer. Meetings are held in Masonic Hall on each Saturday on or before full moon and each two weeks thereafter. Caldwell Lodge, No. 176, I. O. O. F, was organized in May, 1881, with a membership of twenty and the following officers: J. A Rohrer, N. G.; Albert Riser, secretary; J. R. Griffith, Treas. The lodge now has a membership of fifty-two and the following officers: T. H. B. Ross, N. G.; J. W. Nyce, V. G.; J. C. Dunhollen, secretary; W. H. Thompson, F. S.; Clark Black, treasurer. Meetings are held on Saturday on each week in Odd Fellows' Hall. The property of the lodge is a little over $700. Upton Post, No. 27, G. A. R., was organized in October, 1881, with seventeen members and the following officers: L. M Lange, C.; William Morris, S. V. C.; C. Burrus, J. V. C.; W. B. Hutchinson, O. D.; W. H. Thompson, O. G.; J. M Thomas, Qr. ; T. Stancliff, chaplain. The membership of the post has now increased to fifty. Meetings are held in Masonic Hall on the first and third Friday of each month. The officers of 1883 are: L. M. Lange, C.; W. Morris, S. V. C.; S. Donaldson, J. V. C.; W. H. Thompson, O. D.; George W. Fuller, O. G.; J. M. Thomas, Qr; J. N. Miller, chaplain, W. B. Hutchinson, adjutant. The property of the lodge consists of furniture and regalia to the amount of $100. Sumner Lodge, No. 2,633, K. of H., was organized on December 14, 1881, with twenty members and the following officers: J. W. Nyce, P. D.; H. A. Ross, D.; O. Beason, V. D.; J. A. Doubleday, A. D.; J. R. Swartzel, Rep.; P. S. smith, F. R.; J. G. Dunhollen, treasurer; L. Thrailkill, chaplain. The lodge now numbers thirty-six members and has the following officers: H. A. Ross, P. D.; S. Donaldson, D.; C. H. Moore, V. D.; C. Miller, A. D.; J. R. Swartzel, Rep.; J. G. Dunhollen, F. R.; J. W. Nyce, treasurer; S. S. Long, chaplain. The society meets on Tuesday of each week in Groah's Hall. Its property consists of furniture and regalia in the value of $200. Occidental Council, No. 13, N. U., was organized with eighteen members in the spring of 1882, with L. M. Lange, president; Mrs. W. B. Hutchinson, V. P.; J. W. Nyce, Ex. P.; Mrs. Charles Hume, speaker. The union now has twenty members and the following officers: E. H. Kirkpatrick, P.; J. K. Nyce, V. P.; J. G. Dunhollen, Ex. P.; Mrs. Charles Hume, speaker; L. M. Lange, secretary. The order meets on the second and fourth Friday of each month in the K. of H. Hall. Caldwell Lodge, No. 109, A. O. U. W. was organized on August 10, 1882, with a membership of twenty and the following officers: W. Crimble, P. M. W.; P. H. Proctor, M. W.; P. P. Holer, foreman; T. H. B. Ross, recorder; John Dobson, O.; T. E. Dow, guide; George W. Riley, F.; A. J. Luder, receiver. The lodge meets on Monday of each week in Masonic Hall, has now a membership of twenty-eight and the following officers: W. Crimble, P. M. W.; T. H. B. Ross, M. W.; R. Alderman, foreman; H. H. Rowe, recorder; A. Sherman, O.; William O'Connor, G.; E. M. Swaggart, F.; F. M. Carzine, R.
The first banking house in Caldwell was the Merchants' and Drovers' Bank, which failed in November, 1881. No reliable particulars can be obtained concerning this institution, those who are supposed to know about it refusing information. J. S. Danford was president, and W. D. C. Smith, cashier, at the time of the failure. The Stock Exchange Bank was organized under the State law on October 24, 1881, but did not open for business until December 24. It has an authorized capital of $100,000, 10 per cent of which is paid in, and a surplus of $9, 400. A fine stone building was erected in 1881 at a cost of $5,000. The funds of the bank are protected by a Hall burglar-proof chest and time lock. The officers of the bank are: J. G. Woods, president; E. M. Hewins, vice president; Charles H. Moore, cashier; John W. Nyce, assistant cashier; Ben S. Miller, secretary. The Caldwell Savings Bank was organized under the State law in April, 1882, with an allowed capital of $100,000, 15 per cent of which was paid in. It has now a surplus of $4,000. Its officers are: S. P. G. Lewis, president; W. E. Mallady, vice president; T. E. Neal, cashier; C. J. Neal, assistant cashier; George W. Reilly, secretary.